With so many chocolates available on the market in so many gorgeous boxes, what you choose to grace your table with for coffee says as much about your tastes as dinner did. Choosing something fun but light, delicious but impactful without being filling is difficult with so many delicious chocolates on the market. After Eights again? I hope not! 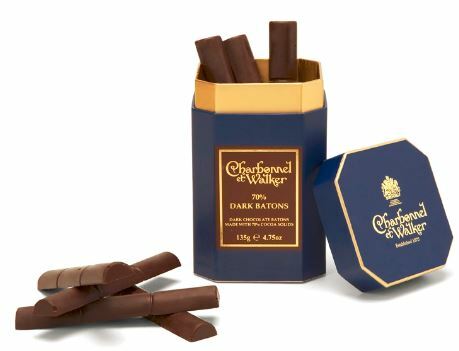 Charbonnel et Walker, who are purveyors of fine English chocolates TO THE QUEEN, have launched their new After Dinner Collection, available in four different varieties; 70% Dark Batons, Sea Salt Caramel Batons, Ginger Sticks, Orange Sticks. Each is different and unique and interesting. I was going to be at what I knew would be a rather large dinner and so as part of my review I thought I’d bring them along and see what everyone thought. The first comments I got were on the box. Everyone was absolutely enamoured with the box. They absolutely loved how sturdy it was, how classic it looked and how well made it was. This is a box that would survive international shipping and still look gorgeous on the table. So after the cooing over the box we opened them up and tried the two I had been given for review (everyone knew these were review chocolates so were thoughtful in their feedback). Inside the beautiful box, the batons were tightly wrapped in cellophane to prevent breakage in the box but it does mean for visual effect, I’d open them before placing them on the table, put a small amount of tissue in the bottom and fan the chocolate batons out in the box. The 70% Dark Batons fared less well than the other box in terms of popularity. I thought with the health-conscious crowd we had that they would be more into the dark than the milk but while everyone tried one, the box they kept going back to was the other one. They weren’t disliked and we were having coffee so a perfect complement but perhaps these would have fared better with cheese. I found them to be slightly biter compared to other dark chocolates (we also sampled Marou that night) but the neutral dark chocolate flavour is going to make these an easy match to many foods. The Sea Salt Caramel Batons did not have a core of caramel (as I was hoping) making them miles less messy than I was expecting. They are a milk chocolate caramel and so quite smooth but the sea salt keeps the edge off the sweetness nicely. These were the popular chocolate of the evening and they were yummy. I enjoyed the slight sweetness because it wasn’t too sweet. Also it was nice to have that milk chocolate with my Nespresso (I think almost everyone in my family now owns a Nespresso machine). I’m not sure I’d eat these as a 3pm pick-me-up but after dinner they were the absolutely perfect compliment. Overall the agreement from my dining companions was that these were absolutely wonderful luxury chocolates in a luxury box. They were impressed with the royal warrant and they loved the milk chocolate caramel with sea salt (as did I). If you’re looking for a beautiful after dinner chocolate to place on the table with coffee, this is the perfect piece. 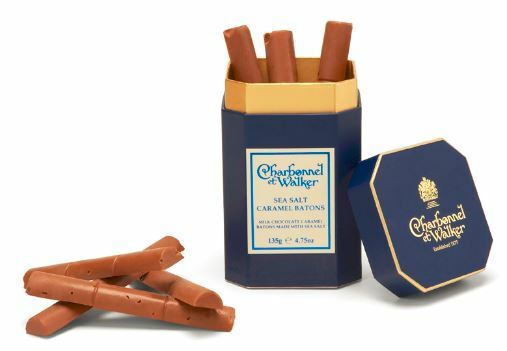 Charbonnel et Walker’s chocolate dipped cherries are one of my first chocolate memories. My parents would buy a bag and enjoy them ever so slowly. Reading this was just so nostalgic for me, thanks for the trip down memory lane! There are a number of chocolates I loved as a kid and I swear they have changed the recipe 😉 but I totally understand what you mean – love nostalgia!